Thanks to Dave Ruth from Niles North High School! Create a class called SnakeBug that extends class Bug. Your bug needs to keep track of two pieces of information: how much it needs to grow by and an arraylist of the Locations it currently occupies. Write a no-argument constructor that initializes variable grow to what will be the initial length of the snake (4 is a good value) and snake to an empty ArrayList(). Run SnakeGame to verify that you can control the snake head with the arrow keys. Creates a new Flower object in a random, empty Location in the Grid. You may want to use a local variable Grid gr as a reference to the Grid the SnakeBug is in. Select a random cell from gr that is empty (null). You may need to try several random cells before you find one that is empty. Make no presumptions about the size of gr — use Grid methods of to determine its number of rows and columns. Once an empty location is found, create a new Location with the row and column value for the random cell and ‘put’ a new Flower object into gr at that newly determined Location (using the Flower’s putSelfInGrid method). should appear in a random Location in the Grid. 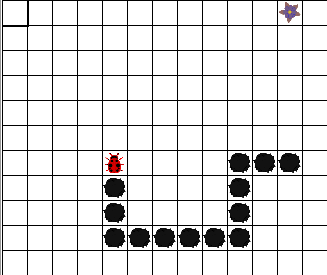 If a Flower is directly ahead of the SnakeBug, increase the grow field by 3, remove the Flower and spawn a new Flower. You may want local variables to represent the grid and the location in front of the SnakeBug based on its direction. If the SnakeBug can move, it moves. It will leave a rock behinds itself instead of a flower. Create and call a method addRockBehindHead that takes in a location parameter. It will create a Rock object at location loc and add loc to the beginning of the snake ArrayList. If the snake needs to grow this turn, simply decrease the grow variable by one. Otherwise, you will need to remove the last Rock in the snake to create the illusion of movement. Write a method called eraseTail that removes the last element of the snake ArrayList from both the ArrayList and the grid.